In the end it will not have mattered that Paul Manafort lied to Mueller. It will not have mattered that he is guilty of bank fraud and other financial crimes that would lock the average American up for decades. It will not have mattered because he knows the president can, and most likely will, pardon him. When the President of the United States is talking about pardons for his friends before his friend’s trials are finished or they are sentenced for their crimes, there is a term for that, and that term is obstruction of justice. It doesn’t border on obstruction as CNN lightly put it, it crosses that border in full throttle. Trump went on to say how brave Manafort has been. Rudy Giuliani told the New York Times: “He really thinks Manafort has been treated horribly.” What are we to do with someone guilty of cheating the government out of hundreds of thousands of dollars in taxes, give them a box of chocolates? I have an idea, try not reporting all your income next year and see if you get a box of chocolates. 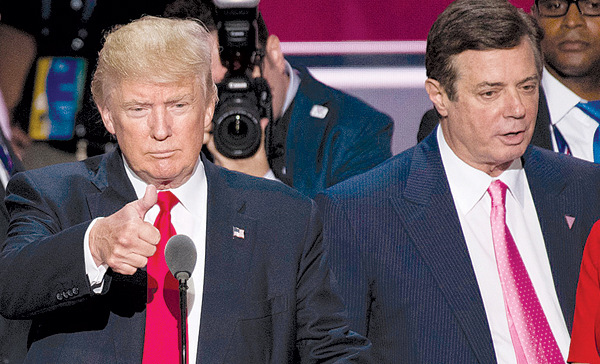 According to the indictment against Manafort, he fraudulently secured for himself more than $20 million in loans, failed to file reports on foreign bank and financial accounts and did not pay any taxes on any of it. Where’s the justice if he’s allowed to slide by? Anyone would be hard pressed to find a time in our government’s history whereby an administration is so corrupt. Trump and everyone around him, including the majority of the Republicans in Congress are as crooked as a dog’s hind leg. They steal, they lie, they cheat and they mislead Americans and have us looking everywhere but the right place for the crooks. Understand this: the crooks are running our country, and they are running it into the ground for money and power to benefit themselves at the cost of everyone else in America. They have thumbed their noses at the rule of law, at decency and at America. They are blatant liars and thieves. They don’t care what others think. They know they are above the law and Trump is going to prove it.